Figure 5-34. - Forceps #150.
together at the tips and curve opposite each other to resemble "parentheses." FORCEPS #286. - Forceps #286 are similar to forceps #65. The biggest differences are that the #286 beaks are wider, and there is a wider space between the beaks nearest the handles when they are closed. These characteristics make the #286 (fig. 5-35) a little more suitable than the #65 for removing maxillary bicuspids. The #286 also is used to remove maxillary incisors and residual roots. Figure 5-35. - Forceps #286. Extraction forceps for maxillary first and second molars are designed as left and right forceps because these teeth are trifurcated. Some of the commonly used forceps for these teeth are the #53L, #53R, #88L, and #88R. Forceps designed for third molars include the #210H and #210S. 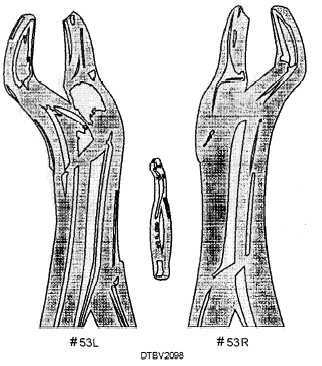 FORCEPS #53L AND #53R. - Forceps #53L and #53R are used to extract maxillary first and second molars. The letters "L" and "R" indicate that the forceps are used on the left and right sides of the maxillary arch. They have straight handles with offset bayonet-type beaks (fig. 5-36). The design lets the dentist grasp the tooth securely for rocking and elevating movements. root portion of a tooth so the dentist can rock the tooth from its socket. The #88L and #88R forceps (fig. 5-37) operate on a wedging principle. They are inserted between the tooth and roots and the surrounding bone. cowhorns. Like the #53L and #53R, they are used on the maxillary first and second molars. They differ slightly from the #53L and #53R in the way they remove a tooth. The primary use of the #53L and #53R forceps is to grasp the crown and The wedging action of these straight handled forceps lifts the tooth from its socket. Figure 5-36. - Forceps #53L and #53R.